What Are My Treatment Options for Acne? Acne affects both male and female patients across all age groups. It can affect your self esteem, shake your confidence and in severe cases can cause depression. 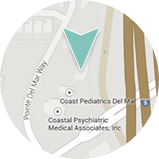 The good news is, Dermatology & Laser of Del Mar offers an array of treatment options to help with mild, moderate and severe acne. Topical and oral medications (antibiotics) are often prescribed for acne. For the most severe cases oral isotretinoine is given, but this can come with serious side effects. Many of our patients choose laser treatment for their acne and acne scarring. Smoothbeam™ and VBeam Perfecta® lasers are popular treatments to induce a long-term remission for individuals with moderate to severe acne. Smoothbeam™ laser works by suppressing the oil glands, shrinking them and reducing the amount of sebum (oil) secreted. Smoothbeam™ laser also stimulates collagen remodeling, which is important to correct acne scarring. VBeam Perfecta® works to decrease red, inflamed lesions and to lighten and reduce red pigmented acne scars. This combination is considered the “dynamic duo” in acne treatment. For those with mild or moderate acne looking for a maintenance treatment or are uncomfortable taking antibiotics, BLU-U Blue Light Photodynamic Therapy (Blue Light) is a great option. Blue Light is FDA cleared to treat moderate inflammatory acne. It is safe for treatment up to twice a week and can be used for prolonged periods. Blue Light works by killing the p.acne bacteria on your skin. With less bacteria there will be less acne. Blue Light is performed on clean dry skin. The patient is seated in a light box and protective eye wear is placed on the patient. Next the Blue Light is positioned to allow for exposure to the entire treatment area. The light source is then applied to the skin for 17 minutes. The patient may experience a warm sensation during the treatment, but it is never hot. It’s safe, comfortable and affordable. There is no downtime, it does not make you light sensitive and you can go right back to your normal activities after treatment. For many patients it’s that extra “something” that makes the difference between breakouts and smooth healthy looking skin. For more information about Blu Light, to take advantage of our summer Blue Light promotion or to schedule your one-on-one consultation to discuss your treatment options please contact us.